Did Manchester City win the title – or did United lose it? First of all, congratulations to Manchester City on clinching a first English title in 44 years. However, I have to say I was expecting Roberto Mancini’s team to win the Premier League in a more convincing manner than with a last-gasp 3-2 win against Queens Park Rangers, who were battling to avoid relegation from England’s top division. I am not going to lie, I tipped City’s neighbors Manchester United for the the league all season long. After United pulled eight points clear of City last month, I did not expect Alex Ferguson’s team to throw it away by losing against Wigan and drawing 4-4 with Everton. Honestly, I think United lost the title more than City won it. On paper, big-spending City were so much better than every other team in the league that they should have been more dominant throughout the campaign. City were up against one of the most mediocre United squads in recent times, a team which needed the 37-year-old Paul Scholes to come out of retirement and help reinforce their midfield. Mancini’s team also faced an Arsenal squad decimated by the losses of Cesc Fabregas to Barcelona and Samir Nasri, who joined City last August. Add to this a Chelsea squad battling to restore form after the midseason departure of manager Andre Villas-Boas and a Tottenham team plagued by inconsistency, and there was no team which had the tools to challenge City. In my view, Mancini also got a lot of decisions wrong over the course of the season. He publicly banished Carlos Tevez from the club after his refusal to warm up against Bayern Munich in September, before bringing him back into the fold for the title run-in. He tolerated all of the craziness caused by Italy striker Mario Balotelli, played attacking midfielder Nasri out of position for most of the season and he failed to successfully rotate his squad. Bosnia striker Edin Dzeko was underused in attack, while players like England winger Adam Johnson were not given the chance to provide a fresh approach. When it came to the final day, City beat an abysmal QPR team - which had been reduced to 10 men with more than half an hour to play - deep into time added on thanks to the individual talent of the phenomenal Sergio Aguero. Mancini was desperate on the sidelines throughout Sunday’s thrilling finale. The closing stages of the season have seen individuals, not the team, rise to the occasion and get the job done. Yaya Toure scored a brace in the previous victory against Newcastle, a header from captain Vincent Kompany beat a defensive United in the Manchester derby and Aguero came up with another huge score on Sunday - the 23rd league goal of his debut season in England. It was incredibly exciting and City fans should enjoy it. I personally don’t subscribe to the philosophy of buying success, but it has worked for them. I’m curious to see what City do next year and how other clubs will improve their squads. But City should have been a far more impressive in victory than they were. Pedro Pinto ... Take off your red-tinted glasses !!!! Can the writer give an example of a club that has not bought success? You Forgot to say that this same City team (with the problematic Ballotelli, underachiever Dzeko, and out of position Nasri) beat United at Old Trafford 1-6!! lol. You're crazy if you dont think City has been the better side all season long. United had many lucky breaks this season, and their match QPR was one of the bigger examples when they got a free penalty kick when the guy who got fouled was coming from outside and the defender from QPR who commited the "foul" was given a direct red card. United were weak all season long. Frankly, City was very lucky on Sunday. I thought City should have won the match easily against a side of QPR quality and against 10 ! Looks like City is not that awesome after all unless they can proof me wrong by winning again next season. Man City won the title. Yes Man U did collapse at the end of the season losing to Wigan and drawing to Everton, then losing to City. But you have to remember that they both finished the season with 89 points, so the title was decided on goal difference. This means that City's win was accomplished in large part because of their performance all year not just at the end of the season, if Man U had been better on goal difference they would have won. The fact that Man City won in "Fergie" time is inconsequential. Every team that wins the Premier League buys it. Did you know that Utd's starting eleven cost ten million pounds more than City's on Sunday? City would have won the league by ten points if they hadn't been the victims of poor refereeing decisions all season. Kompany sent off in the derby match for frightening Nani was the main reason City lost form at that time. They were robbed at Sunderland and at Chelsea, while their cross town neighbours were being given dodgy penalty decisions on a regular basis. City were by far the best team in the league this season. You are just finding it hard to admit it. I think that you will find that it was city who had it won and threw it away with a dip in form drawing at home to sunderland losing at swansea everton and Arsenal, allowing Man Utd to catch up ?? Open your eyes yes UTD have been winning for 20 years but the league is over 100 years old, Uniteds history IS HISTORY welcome to the future its Blue !!. City had the best players and should have won the title by a bigger margin. If a manager is supposed to help a team be more than a sum of their parts, then Mancini did not do his job properly. It all just raises the level of competition in the EPL . And with all the discrediting of United how come we finished 2nd ? For a team that 'Brought out of retirement a 37yr old midfielder' ? Thats 9 GOALS for 3 against... For a team with the worlds most expensive goali...9 goals against!!!! Fact MANCHESTER CITY ARE THE CHAMPIONS. Great analysis. City struggled to beat 10-man relegation-threatened QPR Sunday. That doesn't look like champions. manchester city won it without a shadow of a doubt. they won both manchester derbies (one of them 6-1 away from home), they scored more goals than united, conceded less goals. united have spent a few quid in their time too, biggest spending club in the 90s by a way, and most titles in the 90s. ferdinand remains the most expensive defender in world football, anderson was 18mil if i'm not mistaken, doesn't get anywhere near the team, 2nd most expensive goalkeeper ever who can't get off his line to catch a cross that lands 3 or 4 yards from goal. united will be back. they have great pedigree, a great manager, tradition etc. qpr are a decent side. they beat liverpool, chelsea, tottenham, arsenal and everton, and they put up a great fight against man city yesterday, so i'd hardly say they're 'abysmal'. very poor anaylsis lacking in any serious thought. all in all, a silly article designed to provoke. the things that pass off as journalism. I watched the two games at the same time (2 tv ) .. while man united was "saving" the 1-0 score.. man city was on fire attacking over and over again... man city was the best team at premier league, man united really needs to change players... ferdinand, giggs, scholes, among others... they are superstars , but they should be already in the Hall of Fame. This is as PINTO as anyone can get! You know what Pedro? ....Man City WON it! Well done Man City. I think throughout the season Man City have been the better team, but the title also went their direction thanks to an unexpected Man United collapse in the last few matches in the season. On Dzeko being under used, there is a reason for that and the simple reason is that he was too inconsistent and when given a chance did not provide the goals. On Man City buying the title. Every team buys success, its just Man City's spending is more obvious. Teams like Man United and Barcelona spend money every single summer so that can win trophies, so the theory that anybody buys success is utter bull. On Mancini, I agree he is not that good of a manger, any manager could win the league with the squad he had. People say he controlled the egos, no he didn't there are still some massive egos in there that he has failed to control. This Premiership season regardless of how the teams played in Europe shows that maybe its not all quality, but it is certainly the most exciting and dramatic league in the world. Pinto is in denial of what really happened: "Add to this a Chelsea squad battling to restore form after the midseason departure of manager Andre Villas-Boas". What? I can understand Villas-Boas is portuguese (Pinto's countryman). But Chelsea did not lose the league because Villas-Boas departed, they had already lost under his tenure. At the end, Manchester City won and that's what counts!!!! You have not said anything new; just recycled what we all know, difference is that you are blatantly biased. You wrote an article before to say Man City will NOT win the EPL with Mancini as manager, you are simply massaging your egoistic wrong predictions. They were the better team all season and deserve it. All from a Chelsea fan!! just read the first two lines.. It was painful to watch man u loose the title. City goalkeeper was right they have to win again to prove critics wrong. Don't see them buying again. Arsenal, chelsea, manu maybe newcastle will buy i see a chelsea trend going on here big buys no youth players from academy. city have alot to do. the owner will soon want returns for his pocket money. Look at arsenal. Still manged to finish 3rd. Manu mixed young and old as well. Yup Pedro, you sure do get the lads going with your thoughts on Fútbol! I would suggest a more neutral and balanced view in the future old chap. I would without a seconds hesitation agree that City WERE the best side in the Premiership and United were really pretty fortunate to even get close to be honest! So Mancini takes off Nasri and brings on de Jong v Newcastle to allow Yaya Toure to push forward and Yaya scores twice. Mancini then throws on Dzeko and Balotelli late in the day v QPR. Dzeko scores the equalizer and Balotelli sets up Aguero's winner. And, according to you, this guy knows nothing about tactics?... After a tumultuous season in which they've been publicly chastised and vilified Tevez and Balotelli have each gone on record as saying they want to stay at City. Yet, according to you, Mancini lacks man-management skills?...6 wins in their last 6 games; 6 wins and a draw in their last 8 (including two late late shows v Sunderland and QPR), and, according to you, this amazing run was made rudderless because Mancini didn't rise to the occasion! What other measure is there for the inspirational qualities of a boss besides results?....This is being widely touted as the best-ever season in the BPL and yet, according to you, United, Arsenal, Chelsea, Tottenham, and even City themselves were sub-par!....QPR were, according to you, "abysmal", even though, for most of the match, they successfully utilized the same tactics Chelsea used to beat Barca, and did so against even greater odds due to Joey Barton's red card! Hope you never meet Mark "Sparky" Hughes in a dark alley....According to you, big-spending City should have been more dominant yet they scored more goals and conceded less than every other team!... They also "bought" the title, according to you, which is a point of view that could be argued statistically, but it's invalidated by the fact that buying teams is the BPL norm! As an example, here's a stat to conjure with - of the 55 starting players in the 5 teams that finished below City on the final day of the season only 5 were home grown by their respective clubs. That means 50 were bought, which puts City's "buy the best you can afford" policy into perspective....So, all in all this article is flawed at every turn. You may as well have written "I don't like Mancini and I'm jealous of City. The end." The rest just sounds like sour grapes in the wake of yet another failed prediction. I'm Italian and congratulate Mancini for this important success. Certainly his job was relatively easy with so many excellent players. He made also some mistakes such as keeping Tevez away from the pitch for a long time. But one thing must be acknowledged to him: he's probably the best coach in activity very good in playing soccer: he's still very good in kicking the ball and probably not even Maradona would be able to kick the ball as Mancini is now in spite of his age. Just one last remark: Mancini, please, wave the City's flag not the Italian one ! It's an Italian guy who is telling you this ! I am a Manu fan. Congratulation to city. This was exciting and as a fan that what most matters to me. But don't get carried a way. One in 44 years? most of you won't be alive for the next one. A biased article. Pedro, you are only trying to justify your claim that United would win the title. I remember almost 2 months ago, when you wrote" Mancini would be sacked for failing to win the trophy" The fact that you are a journalist does not mean your opinions are always going to be valid, you got it all wrong mate. Man U did not lose it, Man city won it. Or what is there to say if a team beat you 6-1 at your background and outplayed you at theirs.Get real. proud like Rooney, Dragba BALL not only with them but with others too. Pedro is right. Man U gave up the title for City to keep it for a season. Poor guys never got a chance to hold on to the trophy. So, let them have it for a season. The true fact is, QPR played a spirited game than the City. A desperate City, at the end has unleashed a ploy by using one of their bad man, Carlos and reduced QPR to 10 men. The league members must investigate the incident and punish City for breeding un-sportive elements who tarnish the image of the game. Hats off to Mark and Sir. Alex. I am a die hard United fan and even I think Man City were the better team this season. The difference was that City had a so so manager but was saved by top quality players , while united had average players but was saved by top quality management. At the end of the day, good players do matter. All United have are Rooney, Valencia, Young, and that 's about it. CIty have Tevez, Aguerro, Yaya Toure, Hart, Dzeko, Adams, Silva and likely to get more if they can get past Financial Fair Play. Ooh, but United still have Fergie. What luck? both teams had the league in their hands at some point during the season and they blew it. Those who rush to claim bad luck when things don't work their way are just being stupid. Football is played by 11 aside in the same amount of time and on the same pitch. You dont score you lose. Simple. Man City won the league not because they were luck but because they scored goals more than Man U. How hard is that to grasp for some of you? There is no luck in any game. You snooze you lose!! Pedro, whenever you write about football you have an amazing tendency to be terribly biased. As Sir Alex Ferguson noted, in any other season 89 points would have most definitely guaranteed victory. City outshone every team this year, and even had the heart to fight back after losing their pole position with a few games to play. I'm a Tottenham fan. You Pedro, clearly aren't a City fan. City have played more entertaining football, scored more goals, they have won both head to head matches and Roberto Mancini has clearly won the mind games against the most experienced EPL manager. Manchester United have used money to win many past league titles. Manchester City, having won the last game in extra time will only make this title more memorable as well as more profitable for their sponsors. Nothing should be taken away from this historic victory for city. Well done. If you have excess money will you buy toyota corrola or a BMW ? And whats wrong in spendng money to uplift an insitution ?Good universities get a high class faculty members by dishing out US$ , Same goes with sport or even for that matter R&D ! I think you are biased . Sir Alex is a great man , but this time you should compliment Mancini ( on outsider ) with British press highlighting his problems day in and day out . He held the team together in the last one month of EPL to drive home his point. I think for you AVB and Mourinho are the best .. ( yes I agree about Mourinho, to some extent, but Mourinho also dished out big money in Real Madrid and Chelsea ) but Mancini has been humble ,a true gentleman ,being the only manager to give pre and post match media briefings during the EPL season, Why are you so pro MU ? Results count , trophies count not biased opinions . I'm glad City won. Not because I'm a fan, but simply to break the monopoly of Man U and Chelsea. Also, I think 44 years is a long time to wait. Congrats to CITY. The true spirit of the game will stay for ever with Man U. It is not because of money..It is a culture that had been breed in for many years. Every one knows the achievements of Sir. Alex were not through money. He knows the art of discipline, and true spirited hard work to build a team. 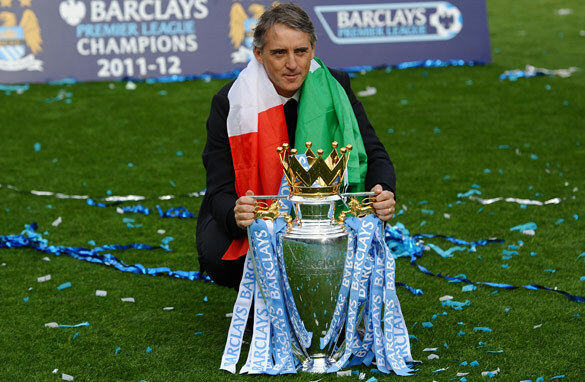 Look at Mancini with the cup...Where is the City flag? He is in London, not to promote his Country, but to promote the Club he belongs to. This spirit won't take City anywhere. It may take another decade for them to win a trophy, unless they buy off all the best players from other teams. Man Utd nuture and groom New Talent compared to City who uses money and buys players who are already good. For me it will always be Man Utd as they have tasted success over a decade now. City are have tasted success only because of Top Players coming into the team. Man City is not capable of forming a team after a plane crash and then Win Titles a not a title like they just did after 44 years years OMG guess my grand children can see them win again after another 44 years. Man Utd are the team to beat. We will come back harder and better next season. Forever Manchester United. @ robert if your team man city with all millions spents won on same point with a weaker team "man u" as you claim, then you have no team at all. Even to lift trophies, cups and shields teams need some experience besides talent on the field. City has very fine players in the squad. If they remain together and play for some more seasons trophies, cups, shields, honors and titles will keep on chasing Roberto, Vincent and those City footballers and fans. A beginning has been made. Congrats to the manager, the footballers and fans. I think Pedro is right on the money – neither team were very impressive, and this in a year when the other top clubs, as the article points out, were in disarray and/or rebuilding. City had purchased better talent and had the occasional great individual play but overall played poorly as a team (which is a management issue); but United, as always, got a lot more out of the lesser talent they had (this is also a management issue....read: better manager). Forget who paid more. They both spent a ridiculous amount and outspent everyone else in the league (and that's NOT a good thing for the league). Both teams had the title virtually wrapped up at one time or another late in the season and both tried to give it away. And QPR gave City everything they could handle in that final match. But for some great individual heroics again by City, QPR nearly won the match with 10 men. City won, by the slimmest of margins, the title, and the final game when they had to, so congratulations for taking the title. But objectively, if this had been any other year, with any other United of the past few years (or Chelsea or even Arsenal from a few years back), City would not have won the title. They were a very underperforming team given the level of talent they had, and that's directly an effect of less-than-stellar management. And you never knew with this City team (or United, or Chelsea or Tottenham this year for that matter) going into a match what type of performance you would get. They won the Championship this year, but if nothing else changes, they're not likely to repeat. A new City dynasty? That's a long way off – stop kidding yourselves. I'm not a Manchester fan at all (red or blue), but there's been one dynasty of the past 20 years in the EPL and they don't wear blue (United have been a dynasty because they have the best manager in the game. Like Sir Alex or not, he's a winner and he instills that in every squad he manages). I don't see that changing anytime soon given the way this title race unfolded. And I bet United will open the season as the early favorites to win the league next year. Pedro you talk like that just to justify the fact that United was the foreseen winner. Yes, it's easy with excellent players but at the end a good coach must be able to choose the right ones and to keep the team united. This is an important aspect in coaching and not all coaches are able to do that ! Pedro, the one thing I see is that you are trying to get an execuse for the failure of your prediction that Man City will not win the EPL.......Better to accept the reality, and I think the best team won. In league football, every team is given an equal opportunity to perform. So when a team emerges on top at the end, they are the best! Afterall, in the EPL, they all played 38 matches! However, for a team whose owners have spent over $1b, i wouldn't rate their performance as awesome! Winning a tittle on goal difference; so much more was expected from them. Real Madrid's victory is awesome 'cos they were 9 points clear at the end. I think it's more a loss for Man U than a win for Man City. However, EUFA needs to be careful not to encourage "buying already made" players all in an effort to just win win win! The young needs to grow and be given a change to play. Kudos to teams like Man U and Arsenal.. Congrats to Man City. At the close of the day, in soccer it is the goals you score and the meanness of your defence that counts, not not how well you play or the quality of your line-up. I am a man-u fan but do magnanimously accept that the cup safely belongs to the blues (or is it the light blues?) for the 2011-12 season. Well done, mancini, you did very well and displayed what man-u failed to maintain – consistency. But look out, a more lethal man-u is just a few months away, and coming! Does money alone buy you success? Ask the Venkys, Carson Yeung, Randy Lerner. Truth is that deep pockets provide you with the raw materials to mould. The manager does the moulding, and Mancini crafted a title-winning side. As long as you play by the rules it doesn't matter how you get there or by what margin, it's all about crossing the finish line first. To say otherwise shows a complete lack of understanding of what it means to be a professional athlete. I think the EPL title should not be won on goal differentials; they should play an extra game to decide the winner if the teams are tied on points at the end of the season. Too many times throughout the season teams can run up the score, which in some circles is viewed as poor sportsmanship; at the point where a team is decisively in control of a game and winning by a good margin, some teams will score more and some teams will hold back and not score more goals out of concern for the sportsmanship of the game – this is where it can be subjective during the season. Can Manchester City be able to defend the title next season? In other to really convince people that, they didn`t only manage to win it, but deserve winning it. mancity needed Mancini all through the season to ensure that they won the epl.Sundays game was the best game i have watched excluding Liverpool-ac Milan in Istanbul.man city played the best football in the epl all season long and they entertained and all that credit falls to ROBERTO who was heavily criticized last season for been highly defensive, but what did he do this season, he built a team with an attacking flair exploiting the talents of yaya toure, aguero,silva,company and zabaleta to the fullest. United blew it this year. They had a several game lead and threw it away. As for QPR, I hate you. You do not win games when you play to lose like you did. very poor analysis. look at the full season. mancini is an extremely strong manager based on his prior and now current record. this writer doesnt see it because he was wrong that they would not win the league. it would have been better with a counter argument from another writer instead of the overwhelming comments suggesting this is a completely inaccurate assessment. Pedro, all year long you have not written a positive article about Man City, I read all your posts, but now I get the feeling that you should overcame some bias towards Man U in your writing. Um grande abraço. I don't agree what Petro said. Mancini was the biggest reason that Machester, City won the title. I follow him from the time he play in Sampdoria, coached at inter in Italy and now in Engalnd. If you analize all the best coaches in the world they have one thing in common and this is: Feeling for the game. This is very important element not only for one game but for all fotball season. Mancini , when Manchester City was leading 8 poind that time was ask from English media if the season is over for Manchester United. His aswer was that everything will be decide in Machester Derby and he was right. That it is show of a exellent coach he is. I think that the reply is in the question. City won a title lost by MU. Very simple. But, this year, City should win with a biggest difference. We had one of the worst Arsenal, MU, Chelsea, Liverpool since 4 or 5 years. Shame on Spurs because they had the second better squad after City. It's a little bit scary for City to be honest. They have a lack of impact player, wing players...They depend too much on Yaya Touré. Will see. Mancini has a lot of stuff to prove in CL next year. United did not lose it, City were the ones that allowed United to catch up. After City's demolition of United at old trafford, there was no doubt who the best team were this season. United were back in title race only due to dip in form of City and dodgy decisions United always get during the season as always. BTW you should know that United's team on the day costed more than City's. Just as some one correctly pointed out before... The league is more than 100 years old and United have won bulk of their titles in past two decades where they were the only team to out spend every other rival in the league. The fact that Mancini was able to stand firm and control the dressing room full of big earning egos speak volume of his abilities. If money and team of superstars was guarantee of success alone, then Real Madrid should have won all the titles and Bayern Munich would have walked through the Bundesliga. Absolutely unconvincing victory for CITY. With all the expensively assembled squad against struggling challengers (Man Utd, Chelsea, Arsenal, Spurs, Liverpool), they still had to win it in the extra time of the last game on goal difference! Admitedly, ManUtd had a very dissmal season; but I cannot explain how City could not win this league with a wider margin and games to spare?? Anyway, we can say all we want, but City are champions...!!! congraturations!!! Worthy Champions??? for another day. Let's me start by stating that I am a proud Man U fan. One needs to be able to give credit where it's due. Any team that can go to Old Trafford and thump Man U 6-1 will get my respect any day of the week. We can debate the ifs and buts of what the season might have been. Bottom line is: Man City won the league. Period. What is so wrong with simply giving credit where it is due???? As a Man U fan, I hope that this defeat will convince us to go into the transfer market, buy quality players and come back stronger next season. For now, congratulations to Man City. This article is ridiculous and super biased. In fact, the only people who agree with this article seem to be biased Man U fans. First of all, the title is invalid, considering the fact that Man City slipped up FIRST. By your logic, the title should be "Did Man City allow Man United to have the chance to stay in the title race, before eventually winning it?" That sounds about right. Second, you call QPR abysmal. That's funny. So if QPR are abysmal and they lost to City 2-3, what does that make United? You know United lost to city at OT 1-6, right? Not sure if you know that because if you did know that when you wrote this article, your same faulty logic would mean that QPR is actually better than United...since they played a better game than United played against City on BOTH occasions. QPR lost at home to City 2-3 as well, just so you know (not sure you were aware). So explain how QPR played better against City than United did? Surely an abysmal team can't do that Pedro! Your argument is invalid because teams matchup differently with each other. If you took that into consideration instead of quickly expressing your thoughtless, biased rant, you would've seen that. Third, you say City should have been far more impressive than they were? What does that even mean? How much more impressive would you like a team to be? Was 6-1 over the former EPL champions away from OT not impressive enough for you? How about the dominance in the return match? Or maybe you missed out on the 5-1 away win at Spurs? You state opinions but then you don't judge such biases on the same variables. It's shocking. Fourth, glad you don't subscribe to the philosophy of buying success. That's good to know. So I guess then you don't subscribe to Man United either then? Since they bought their success back in 1987 in the early Fergie days? Which undoubtedly played a major role in United's future success? I'll let you Google that story on your own time. Overall, the worst oppinionated article I have ever read. City scored the most goals and conceded the least in the PL this year. City's points total would have won the PL in four out of the last 5 seasons. Pretty much every neutral and respected football contributor have agreed that we've played the best, most entertaining football in the PL this year. City outplayed United in both PL encounters, with a 7-1 aggregate. City won the last 6 games of the season (as we did last year) – isn't this United's "squeaky bum" strength ? City came back repeatedly to salvage wins & draws. United didn't manage it once all season. a cheating dive from an offside Ashley Young. Several more spring to mind. City's record against the top 6 teams reads 8 Wins 2 losses. and lost only in extra-time. Look how many QPR players threw themselves into attempted blocks & tackles for Aguero's winner – I counted at least 5, including Onouha's lunging foul at the last. – think that puts the QPR 'gave up' conspiracy to bed. Real Madrid have been the richest & most over-funded club since their inception as the kings team. Man United won their first PL title with the most expensively assembled squad ever in English football history & still hold the record for most expensive teenager, defender & goalkeeper in the league (& 2 of those were over 8 years ago!!!). United won their first ever English title, in 1909, as a result of their spending power, buying City's best players and top-scorer the previous year. Wayne Rooney tries to quit United, gets biggest contract in PL history. to manager, team-mates & fans. Still plays big part in our successful run-in & wants to stay. Balotelli, comes on plays positively, maturely & creatively & provides assist to winning goal. Committed to City. for correctness from my previous post, United did come from behind to draw at Chelsea. 1. The greatest commitment to youth policy and development in the league. It was pretty impressive before. ... I believe we have the best match day food too! Pedro, I have to disagree with you on many points. Firstly, MCFC have reached 89 pts, thats by far the teams best ever pts total(18 pts more than last season), and 9 pts more than the United team that won the title last year, so saying "United Lost it more than City won it" doesn't cut the mustard on a purely statistical basis. In fact, this season is arguably the best battle the EPL has ever seen. in addition. Quite simply City have been a project for the last 4 years and have been improving dramatically since the takover in 2008. (10, 5th, 3rd, 1st). City deserve this league based on the fact that they did the double over united with an aggregate of 7-1 in their two league meetings. This sounds like an article from a Man U fan who is still in some diestress. City played exceptional football this year, but this is also a group of players that have played together only for a couple of years, unlike United who like Barcelona has had a relatively stable team over many years (Evra, Ferdinand, Scholes, Giggs, Rooney, Fletcher, Carrick, etc). And City beat Man U twice, actually completely destroyed them at Old Trafford, so I think there is nothing to take away from City. They are the worthy champions and congratulations to them. If Wigan FC had not had a late end of season injection of motivation and had beaten Manchester united then City would also have been dumped out of the Premiership race too. Wigan were the key...They beat Manchester United and then went on to beat Arsenal which was key to their survival in the premiership. City did not win it...Manchester United lost it...The celebrations at the end of season was for Mancini keeping his job and not for Manchester city winning the premiership.